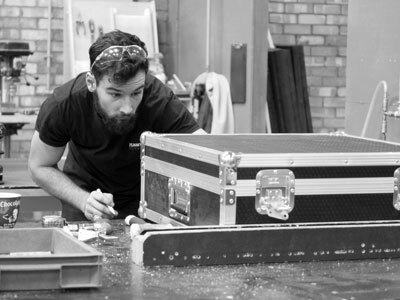 The Flightcase Warehouse are specialists in the design and manufacture of Flight cases from one offs to production runs. Our flightcases are used in numerous industries including: Music-Audio Visual-Film, Broadcasting-Motorsport etc. 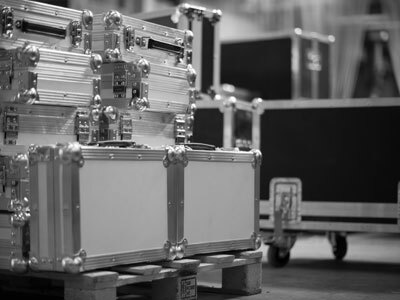 We have over 2000 standard cases, off the shelf all available to view and buy in our online shop, you can search for a flightcase by industry, application, manufacturer or type. Friendly and experienced staff are always at hand to ensure you get what you want, when you want, with emphasis on Quality, Service and Value. We have over 60,000 sq ft of production, warehouse space and showroom facilities where our customers are more than welcome to come and visit and browse all our products. Please feel free to bring your equipment for a final fitting if required. Follow road down for approx 1/2 mile turn left just before Mates for deliveries & collections. For office & shop keep going then turn left into Gerard.